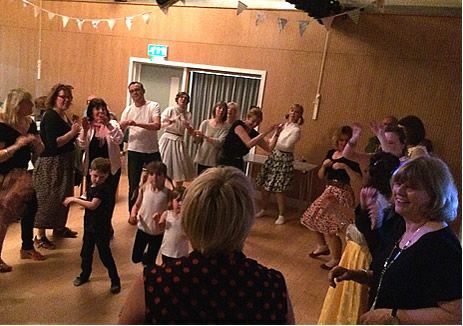 Following the success of last year's Mamma Mia sing-a-long evening, on Friday 28th April we reprised our popular musical movie event with the biggest hit of 1978, Grease! It proved to be a very popular choice, with more than 60 turning up from as far as Coxwold and Shipton! Many came in various "Grease" themed costumes, the ladies having more of a challenge than the men; white t-shirt, jeans and leather jacket appeared to be readily available wardrobe items! This timelessly funny story of 1950's teenage love, peer pressure and cliques has gained fans in every generation thanks to a great cast, catchy soundtrack and endlessly quotable lines. Even in Husthwaite (and beyond!). From the beginning the audience were in full song, surprising themselves with how many of the songs and lyrics they knew. However, on more than one occasion, surprised that some of the lyrics they thought they knew weren't quite as they had been singing for all those years......with a few "Oh, is that what they said!" and even "what does that mean?" Aaah....the 70's. Interval hot dogs and Ice-Cream soda's seemed to hit the spot, virtually flying out of the serving hatch, with and without onions or even just onions. This was followed by a demonstration "dance like your daddy" where the organisers need not have worried about encouraging people to join in, the floor was packed! Overall, a fantastic night, well attended and what is now a well-established Husthwaite themed event. The team are already working on next year's ideas. A very special thanks to Elaine Gilson-Fox for providing and leading the dance demo; Elaine runs a Zumba class in the Village Hall on Tuesday mornings which is great fun and as energetic or not as you want it to be. Please give it a go! And thanks to Annabel and Maddie for outstanding bar & interval food duties, much appreciated.